FAQs - What Can Microscopy Show Me? What Can You SEE in YOUR Blood? * bacteria, parasites, candida / yeast / fungi (the latter cannot live in the alkaline environment of your blood - so is indirectly extrapolated - so beware of all those folks who can 'see' candida in your live blood - totally bogus! This is the use of a specially configured, very high-magnification microscope, camera and monitor - tools for seeing the details of one drop of blood - gently taken - for viewing at the cellular level. This allows the practitioner to view blood, immediately upon having taken it, at 9000 times magnification. The quality, details, behavior and condition of your red cells, the different kind of white cells with their unique functions and other information such as platelets, pteroharpens, microbes, further tell their own story. These very specific details, taken in consideration together, disclose a vast array of information so that one can to synthesize which imbalances and deficiencies need correcting. 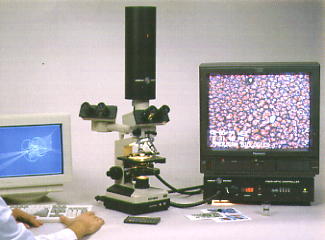 Nutritional Microscopy is also an exceptional educational tool. When you see your very personal details for the first time, you realize that there is an incredible dynamic activity taking place within you - an awesome microcosm - and that you can begin to better understand the specifics that need to be addressed without guessing in vein, without purchasing unneeded supplements or investing in unneeded therapies and pharmaceuticals that may or may not have hit the mark. It has been shown that client compliance is greatly improved with understanding why a change is required and what that looks like. For most of us, seeing is empowering. You’ll see yourself through a powerful window and view your dynamic micro-life processes going on in one of the most important of your body fluids. Red cells, white cells, T cells, B cells, toxins, bacteria, crystals, heavy metals, symplasts, speed of red blood cell deterioration and so forth, are the center of our focus and give us our insights. And there's the additional bonus: live blood analysis helps to identify potential conditions that might not otherwise have been obvious and overlooked till they've developed into a further stage of disease. How is a Microscopist Trained? A microscopist's training should consist of a thorough understanding of oxidology, pleomorphism, anatomy, nutrition, ontology and physiology. This should be a minimum expectation. Additionally, a lot of self education and continuing education is called for, coupled with attending classes given throughout the world by advanced teachers and lecturers as more information becomes available. Much as with other alternative modalities, some teachers require a certain amount of documented sessions after a course before a certificate is given while other teachers simply pass on what they know in an ad hoc basis and some teachers are fantastic and some might be questionable. Each teacher brings a bias into their work from their own perspectives, experiences and specialties, including myself. Training and learning never ends. I use the knowledge of pleomorphism, North American oxidology, European biological medicine, hopefully unbiased research and the knowledge of ortho-molecular medicine as a basis. I also analyze blood from a nutritional perspective when that's appropriate.The best practitioners and teachers tend to be the ones that are not operating from the perspective of product sales. My teachers are listed at the "about" section at this blog. Why Doesn’t my Medical Doctor do This Test? Medical doctors are an integral component of anyone’s health care puzzle, but not the only piece. The reality is that no one area of medicine has all the answers, especially in a medical system that allows 7 minutes per person per visit for health guidance from a GP in Canada. A GP therefore can not spend the time required to become acquainted with your specific details in a seriously comprehensive manner and can only take a stab at it - including which tests to request. Medical / nutritional microscopy knowledge evolved outside the regular mainstream pharmaceutically oriented medical-school establishment for the last century. Consequently it was looked at, hence not understood, consequently never accepted and therefore not taught or appreciated within the usual medical/pharmacological establishment. This same system also greatly discounts the importance and science of homeopathy, herbalism, nutrition and metabolic conditions (an example is the long fought battle to bring ortho-molecular medical knowledge to doctors). Health Care needs to be an integrated process and live blood analysis ideally would be a serious piece within a true comprehensive system, assuming that the health and healing of the patient were the true focus and priority. But we are far from that sort of an open-minded, honest system evolving. Emergency medicine, by virtue of it’s nature, has my unwavering respect and the traditional system of medicating the symptoms as a form of curing and as a first rather than last resort, has my obvious disdain. Persecution of brilliant people who are on the front lines and cutting edge of scientific healing and research and who are using new paradigms instead of pharmaceuticals is rife (pardon the pun). Live blood analysis, with powerful microscopes, has been practiced for the last 100 years - approximately as long as our present pharmaceutically oriented mainstream medicine exists! It is the pioneering work of European scientists such as Drs. Deschamps, Descartes, Bernard, Heitan, la Garde, Bolen and Dr. Gunther Enderlein that we can look back with great gratitude. They gave us the basics: the assessment of the body's “terrain” and that whole sphere of science that proved that mono-morphism is a fallacy and that we are not internally sterile but a belief, that still holds true in pharmaceutical medicine. Even though Louis Pasteur’s beliefs and scientific work somehow prevailed through the earlier times and even to this day, by his own admission, Pasteur claimed: “le milieu est tout” on his deathbed. Californian, Dr Virginia Livingston Wheeler and our great Canadian scientist, Gaston Naessens (both doctors were stymied and persecuted), are just two examples of brilliant minds who have continued this research work, not to mention the people who carried on with Dr. Enderlein’s work in Europe and North America. Are you ... suffering from frequent bouts of fatigue and chronic tiredness? Your first analysis consists of an in depth microscopy session that covers all areas that we can see, so that basic recommendations can be suggested and all of the 'dots' can be connected. This also includes your information such as current and prior health and diet habits and concerns, specific stresses, lifestyle uniquenesses, past illnesses and environmental exposures, correlated with it’s what I see in the microscope as a complete picture of you, that guides us. Taking that one drop is not painful and you just feel a light prick. Your consultation lasts for 3 hours or so hours with a full written report and guidelines. Further sessions are only for tweaking and follow-up purposes. They last no more than 2 hours; these follow-up sessions become quite in-depth as you become more informed and in tune with your body, your knowledge and your improvements. Your understanding and eagerness to be self empowered are the most important components in this healing process. Therefore, your sessions are educational in nature and create an atmosphere of questioning and interaction to ensure that you are fully on top of your own health issues. The initial session costs $150 (plus tax). What Exactly is a 'Darkfield' Microscope? Darkfield is a type of microscope lens that utilizes a fiber-optic light source and transforms how light comes onto the slide and side-lights particles in the specimen on a dark background - for special, enhanced viewing of details under high magnification. This type of lens shines light straight through the specimen - which is useful for the dry peripheral part of the analysis. When light shines straight through a specimen, transparent objects are almost invisible. What is a 'Phase Contrast' Microscope? This is another type of lens - a way to view live blood such that the light beams through the specimen. What is a Dry Layer Test? This is a method of seeing any free radical damage, certain conditions of tissue and potentially toxic conditions and gives even more information in regards to dysbiosis, mineral imbalances, sluggish organs, mal-functioning tissue, mal-absorption, mal-alignment, inflammation, some vitamin deficiencies such as C and B12 and other areas of “physical stress”. I take a series of very thin blood layers from that one drop in a specific manner and let them dry on the slide. The twelve plus steps of the clotting / coagulation cascade causes your blood to dry in a very specific manner - showing specific patterns of fibrin and fibrinogen. This gives us clues for many facets, specific stresses, mycotoxins and/or imbalances and reveals more information. The dry layer, also called the peripheral blood test, originated in France about 100 years ago by Drs. Heitan, Le Garde and Bolen (Bradford). There has been a lot of misinformation spread through “health” magazines, some self-serving sources and supplement sales! Our blood, which maintains a narrow pH range of 7.35 to 7.55, is slightly alkaline. Our blood must remain in this tight alkaline range for us to be alive. Our bodies' "programs" know that there is a priority to keep this pH steady. Saliva has it's own ideal pH as does urine (different at different times of the day). Minerals and other necessary buffering elements are extracted from other tissues, too, such as muscle and bone and 'donated' to help with this job balancing act, 24/7. Some body organs and tissues and fluids are alkaline and some are acid and all are interconnected. Over time depletion can set in and cause imbalances in the 'donating' tissues, fluids and organs and this then causes people to say that they feel "acidic". Why are the Lymphatics Important? This very essential part of our housekeeping is often overlooked. The lymphatic system is our 2nd circulatory system and responsible for overall “garbage collection and synthesis”. Most of the lymphatic "pick up" comes from the extra-cellular fluids and some from organs such as the intestinal tract (the millions of villi, for example). Your lymphatics run parallel to your blood circulation system, except that it is not a circuit rather it is a system that starts in the farthest areas of your body and flows and gathers into both sides of your chest and joins into your blood circulatory system where the collected wastes are deposited in the appropriate organs of elimination or recycled. Been from pillar to post seeking advice?